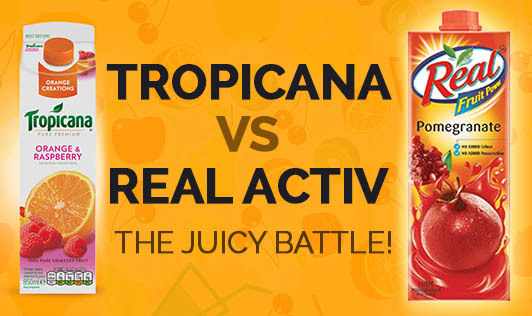 Tropicana vs Real Activ - The Juicy Battle! Do they taste as delicious as natural juices or do they compromise on something? 2. Ready to serve fruit beverage with no added preservatives. Variants: Fruit beverages include Orange, Cranberry, Apple, Mixed fruit, Pineapple, Mango, Guava, Litchi, Tomato, Grape, Pomegranate and 100% Tropicana Variants. Variants: Orange, Carrot juice, Multi-fruit, Apple, Mixed Fruit Spinach & Cucumber Juice, Mixed Fruit Beetroot Carrot Juice and Real ActiV+ fiber variants. My Take: As a Health Expert, here is my take on the above mentioned beverages. These juices which sell on the basis of good quality nutrition are fairly good when compared to the fizzy drinks and other non fruit beverages. The range is definitely appetizing especially when they are tagged as ‘natural and sugar free'. They can awaken our taste buds, making it a perfect refreshing drink at anytime in the day. They are indeed an "on-the-go" choice, keeping us hydrated at all times and offering the complete goodness of the juice. • Even though fruit concentrates are present in good quantity, there are stabilizers, acidity regulators, added colors and flavors. • Tropicana claims to contain approximately 13g of sugar /100ml including the natural sugars. • Both Tropicana and Real Activ claim to provide 1/5th of our vegetables and fruits daily requirement. • Sodium content in Real Activ juice is slightly higher than Tropicana varieties. So, Tropicana claims to have a lower sodium content. .
• Talking about fiber, we know that the benefits are many! But the amount of fiber present in these juices is negligible. • The price of a 200ml juice pack ranges between Rs. 90 to to Rs.140..
To compete with, Dabur has recently launched Real ActiV+ Fiber. Yet, the amount of fiber that you get from whole fruits and vegetables cannot be obtained from any of these juices. Bottom Line: Be it Tropicana or Real, they can definitely complement your major meals, but not replace them to fulfill the requirement of essential nutrients. Hence, for weight watchers, diabetics and people with heart ailments, all you need to do is - grab an apple, a piece of a melon or a bunch of grapes! This way, you will keep a check on the unnecessary sugars and calories that come with these drinks.